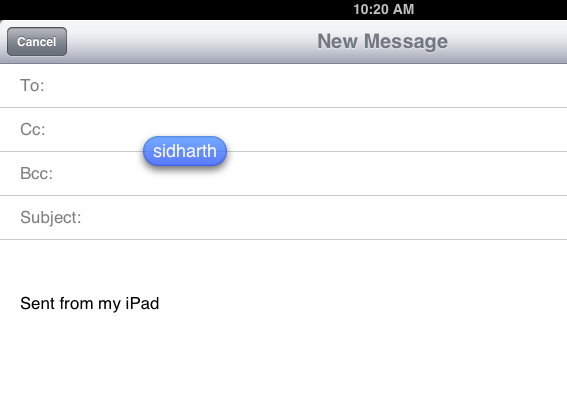 In new iOS 5 for iPad and iPhone, apple added some new features on Mail app. Mail app is the same but it has some new features like Text Formating, Flagging Mail, mailbox management and more. 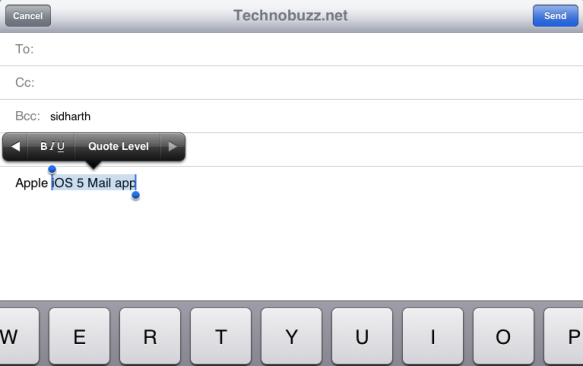 So now you can formats your email text as bold, italic or underline. That mean’s now you enjoy bold, italicize, and underline text format on your mail, also flag e-mails as important, mark e-mails as unread, and create or delete mailboxes. Its simple to use select the the text that you want to format. Now Cut, Copy or Paste menu comes up. Now Tap the right arrow button on Bubble. Now Select the option titled BIU to be able to select the format options like Bold, Italic and Underline. Here’s an example of all text formatting option. 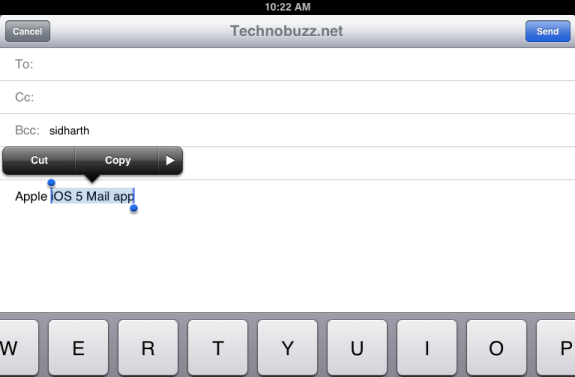 To get started compose a new message on you app and add the Recipient name to send email. 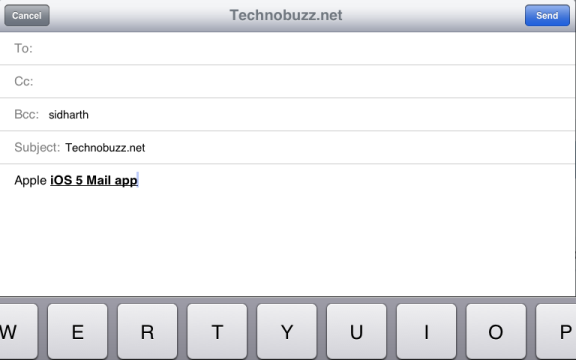 Once you have an email address added, you can drag it around to rearrange in the address fields. With this you can easily move peoples to CC or Bcc. See the Screenshot below. Flagging your mail is also another new Feature in Mail app that Apple introduces in new iOS 5. 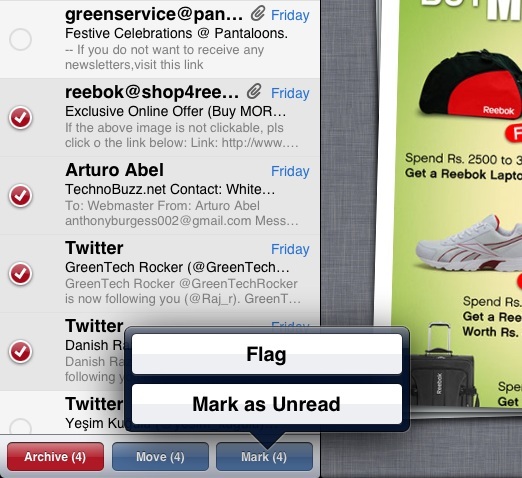 With the help of this option now you can Flag your important mail and also mark them as Unread. To do this Select the Edit option on your mail box and select all the email that you want to Mark as Unread or Mar a Flag. After the selection Tap on The Mark, Now you can either mark the particular email as Unread or as said, Flag it. 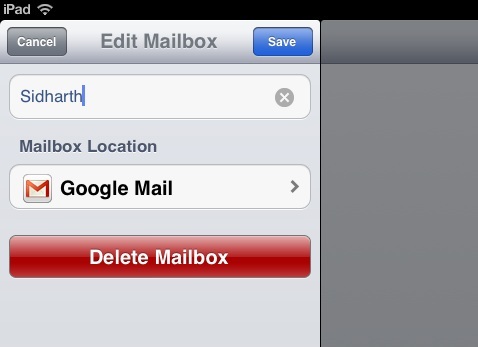 Now you can easily Add and remove Mailbox. To add a new Mailbox tap the Edit button your Inbox and hit the New Mailbox button on the bottom.